Hard disk drive prices are unlikely to return to pre-flood levels until 2014 despite rising production levels, thanks to surging demand, vendor lock-in and a market dominated by just two suppliers, according to analysts. Had there been no floods, and had the industry managed even just the 20%/yr increase in bit density that is now projected, and had margins remained stable instead of increasing dramatically, prices in 2014 would have been about 1/2 their pre-flood levels. So, three years later, costs will be at least double what would have been predicted before the floods. Keene said WD had "recovered" more quickly than industry commentators had forecast – the plants were nearing full capacity some months ago – and said only some high-spec products remained in tight supply. Seagate will miss its fourth quarter's sales target as its competitors recover faster than expected from floods that knackered hard drive supplies. a significant number of folks who have suffered through SSD failure have so suffered not because the flash wore out, but rather because of an actual component failure—a flash chip died, say, or the controller died. Component failure can occur in any device, and if memristor-based drives are eventually manufactured and assembled in the same plants by the same companies who make today's HDDs and SSDs—and we have every reason to believe they will be—then a memristor-based storage drive with a million-write endurance rating would likely be effectively immortal. Other components are likely to fail long before the storage medium reaches its write endurance limit. There are several post-NAND technologies jostling for prominence, such as Phase-change memory, resistive RAM, memristors and IBM's Racetrack memory. All promise greater capacity, higher speed and longer endurance than flash. It's not clear which one of them will become the non-volatile memory follow-on from NAND, but, whichever it is, the controller software crafter to cope with NAND inadequacies won't be needed. MLC NAND wear-levelling and write amplification reduction technology won't be needed. The NAND signal processing may be irrelevant. Garbage collection could be completely different. Entire code stacks will need to be re-written. All the flash array and hybrid flash/disk startups will find their software IP devalued and their business models at risk from post-NAND startup's IP with products offering longer life and faster-performance. They point out that a bit on a hard disk drive uses about 3 million atoms while their molecule has just 51 atoms inside it, including the single iron atom they've inserted at its centre. Wow, that's 58,823.5 times denser, say 50,000X for argument's sake, which would mean a 4TB hard drive could store 200PB using molecular bit storage. - except that it couldn't ... If molecular bit storage is ever going to be used, it will be in solid state storage and you will still need to access the bits – with one wire to deliver the electric pulse to set them and another wire to sense their setting. Even using nanowires, more space in the device would be taken up by circuitry than by storage. New numbers show hybrid drives, which combine NAND flash with spinning disk, will double in sales from 1 million to 2 million units this year. Unfortunately for Seagate — the only manufacturer of hybrids — solid-state drive sales are expected to hit 18 million units this year and 69 million by 2016. ... If hybrid drives are to have a chance at surviving, more manufacturers will need to produce them, and they'll need to come in thinner form factors to fit today's ultrabook laptops. The demand for HDD capacity continues unabated as there is no alternative whatsoever for fast access to online data; NAND flash fabs are in short supply and have a long lead time. In 2011, 70 per cent of all the shipped petabytes were HDDs, with optical, tape, NAND and DRAM making up the rest. Some 350,000PB of disk were shipped, compared to about 20,000 PB of NAND. WD's COO, Tim Leyden, reckons another 40 NAND fabs would be needed to make 350K PB of NAND, and that would cost $400bn at $10bn/fab capable of shipping 8.8K PB/year. It isn't going to happen any time soon. 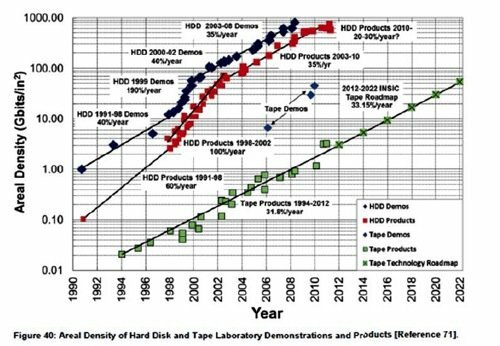 WD says that HDD areal density growth has slowed from an annual 40 per cent compound annual growth rate to just 20 per cent as the current PMR recording technology nears its maximum efficacy, with a transition to energy-assisted magnetic recording (EAMR) coming and representing the possibility of regaining the 40 per cent rate. Our contact said that 5-platter 3.5-inch drives were a possibility. With a trend towards thin and light drives for Ultrabooks, the possibility of platter addition is denied in this market sector. Vendors shipped close to 489 million smartphones in 2011, compared to 415 million PCs. Smartphone shipments increased by 63% over the previous year, compared to 15% growth in PC shipments. Canalys includes pad or tablet computers in its PC category calculation, and this was the growth area in PCs. Pad shipments grew by 274% over the past year. Pads accounted for 15% of all client PC shipments.Â Desktops grew by only two percent over the past year, and notebooks by seven percent. An Amazon Web Services data center in northern Virginia lost power Friday night during an electrical storm, causing downtime for numerous customers — including Netflix, which uses an architecture designed to route around problems at a single availability zone. The same data center suffered a power outage two weeks ago and had connectivity problems earlier on Friday. Netflix, Pinterest, Instagram, and Heroku, which run their services atop Amazon's infrastructure cloud, all reported outages because of the power failure. At 7:24pm PDT, a large voltage spike was experienced by the electrical switching equipment in two of the US East-1 datacenters supporting a single Availability Zone. ... In one of the datacenters, the transfer completed without incident. In the other, the generators started successfully, but each generator independently failed to provide stable voltage as they were brought into service. ... servers operated without interruption during this period on the Uninterruptable Power Supply (“UPS”) units. Shortly thereafter, utility power was restored ... The utility power in the Region failed a second time at 7:57pm PDT. Again, all rooms of this one facility failed to successfully transfer to generator power ... all servers continued to operate normally on ... UPS ... power. ... the UPS systems were depleting and servers began losing power at 8:04pm PDT. Ten minutes later, the backup generator power was stabilized, the UPSs were restarted, and power started to be restored by 8:14pm PDT. At 8:24pm PDT, the full facility had power to all racks. ... Approximately 7% of the EC2 instances in the US-EAST-1 Region were ... impacted by the power loss. ... The vast majority of these instances came back online between 11:15pm PDT and just after midnight. Time for the completion of this recovery was extended by a bottleneck in our server booting process. ... The majority of EBS servers had been brought up by 12:25am PDT on Saturday. ... By 2:45am PDT, 90% of outstanding volumes had been turned over to customers. We have identified several areas in the recovery process that we will further optimize to improve the speed of processing recovered volumes. They also provided detailed descriptions of the mechanisms that caused the customer impacts, which should be required reading for anyone building reliable services.